Following the Consecration Ceremony in February 1950 the first Regular Meeting was held in April 1950. Anton Lodge was formed as a Dining Lodge with members wearing dinner jackets and bow ties (a tradition still continued to the present day). The initiation fee for joining was £14 0s 0d and being a Dining Lodge the annual subcription was £5 5s 0d (£5.25) which also included dinner at each of the seven meeting. Anton Lodge is proud to be a member of the Royal Gloucester 'family' of Lodges and we can trace our heritage back to 1772. After the Second World War the membership of The Saint Hubert Lodge topped one hundred, and following a petition to the United Grand Lodge of England, Anton Lodge was formed. The Lodge was informed in February 1952 of the death of His Majesty King George VI and a three month period of mourning was declared. Grand Officers, Provincial Grand Officers and Officers of private Lodges were required to wear one black rosette at the point of collar. During the period Lodge Agendas were printed in black (normally blue) with a black border. In June 1964 an emergency meeting was held at the request of the Worshipful Master and Wardens of Othello Lodge No 5670 English Constitution, Larnaca, Cyprus. The dispensation from Grand Lodge read "for the purposes of raising a Brother at the request of an overseas Lodge who by reasons of his occupation may be moved before the Lodge resumes." This is the only time that the Lodge has ever met during the summer months. In May 1965 it was proposed and seconded that a Petition be put to Grand Lodge that a new Lodge be sponsored by Anton Lodge. The proposition was carried unanimously and Norman Gate Lodge No 8116 was formed. Since its inception Anton Lodge has had many members who have made great contributions to the Lodge and Freemasonry, the most notable of which is Rt W Bro James Edward Bullen, Provincial Grand Master. In April 1953 Mr James Edward Bullen was Initiated into Anton Lodge, and Installed as Worshipful Master in 1961 by Sir James W Stubbs Grand Secretary. Following appointments as Provincial Grand Secretary in February 1974 and Assistant Provincial Grand Master in December 1978. 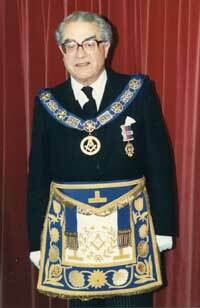 W Bro James Edward Bullen PSGD was Installed as Provincial Grand Master for the Province of Hampshire and Isle of Wight at Southampton on 2nd July 1986. Rt W Bro James Edward Bullen relinquished the appointment in March 1991.